The South American Coati, Nasua nasua, is a member of the raccoon family (Procyonidae) and is usually easily recognised by its reddish-brown fur, long banded tail and dark elongated snout. It is also known as the ring-tailed coati, though the rings on the tail may be quite weak. The fur colouration may also vary: there are many subspecies. The name ‘Coati’ comes from native American Indian words cua, meaning ‘belt’ and tim, meaning ‘nose’, referring to the way coatis tuck their nose into their belly while sleeping. Its scientific name, Nasua, comes from the Latin word for ‘nose’, referring to its long snout. The South American Coati has a varied diet, comprising a range of invertebrates and fruit. It forages both in the trees and on the ground and uses its flexible nose to probe into crevices and leaf litter in search of food. 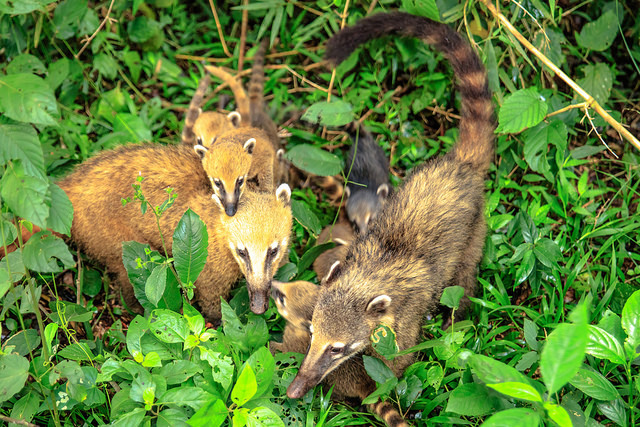 Adult females, infants and immature Coatis live in groups of up to 30 individuals, whereas adult males are usually solitary. A pregnant female will leave their group to build a nest in a tree where she will give birth, usually to a litter size of three or four young. The infants are able to walk and climb by the time they are a month old and within six weeks of birth the female returns to the group with her young. 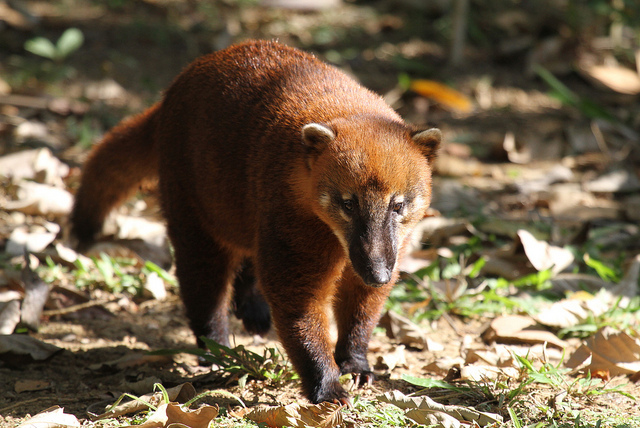 The South American Coati occupies forested habitats in South America, from Colombia and Venezuela in the north to Uruguay and northern Argentina in the south. The species is widespread and relatively common in areas of intact habitat, but populations are under threat from hunting and the destruction and fragmentation of forest in Central and South America. However, the level of threat and the relative decline in numbers is not well known as this species is relatively unstudied.